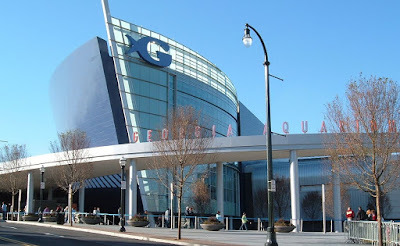 Georgia Aquarium in Atlanta, GA, USA. I love the Georgia Aquarium. My family has held a membership there since before we moved into our house last July. So it is with a great deal of love that I offer this critique. It is not easy to learn at the Georgia Aquarium. Interactions with docents are a notable exception, but those can be more challenging to come-by during peak traffic times. Shoulder-to-shoulder with a rainbow of tourists, I find myself longing for information about the fantastic animals I see on trip after trip. Last Wednesday, I hoped that my wish would be fulfilled when I finally had an opportunity to visit Aquanaut Adventure: A Discovery Zone. According to the Aquarium website, "this new addition invites guests of all ages to embark on an exciting, educational journey through the Aquarium’s upper levels while completing a series of entertaining challenges." Upon entering the exhibit, visitors are invited to work in teams and given an iPad device loaded with a program set to navigate the teams through the exhibit, giving them a challenge to complete in each of the exhibit's gallery spaces. The iPad program is promising, using a gps to guide visitors to their next challenge, overlaying animations on the physical walls of the exhibit and using the device's camera technology to record images of completed challenges, issuing teams virtual "badges" in a progress bar. Other challenges consisted of multiple choice and true-false questions that could be answered on the device, with "free passes" available for missed answers. Game mechanics can be a great motivator for learning, and this exhibit setup had a lot of potential. Unfortunately, it failed to live up to this potential on a number of counts. First, for the information-based iPad quizzes, it was unclear where visitors were expected to actually learn the necessary information. The multiple choice and true/false questions felt like a guessing game which seemed odd to me given the potential for lots of interesting information to be loaded on the device or available in the physical interactives in the exhibit. Second, many interactives were broken or missing pieces. The aquarium did not seem to plan for the shear volume of visitors coming through the exhibit. Third, and most importantly, the iPads were largely a distraction from the most engaging features of the exhibit-- simply being above the primary exhibits of the aquarium. Above River Scout, we could see the tops of the rivers and the smaller tanks interspersed. There were tanks featuring smaller animals which we almost missed because our eyes were glued to our screen and we were being directed to move onto the next challenge. The most amazing spaces in the gallery offered an additional touch-tank and a view of the beluga whale tank where trainers were working with the animals. If we hadn't put our iPads aside, we would have missed these experiences entirely. Since so many aspects of Aquanaut Adventure already seem to be in need of maintenance and repair, the Georgia Aquarium staff should consider adding more information to the game, inviting visitors to dig deeper if so inclined without an artificial time-limit compelling them ever onward. A discovery zone should give visitors the needed white space to direct their own experiences and the depth of information to facilitate connections and true "discovery" visit after visit. Georgia Aquarium does offer an "Animal Guide" on its website, but this feature is buried. I first stumbled upon it by viewing a webcam of the Ocean Voyager exhibit and then finding a separate link to the animal guide for the gallery. This guide is fantastic, offering a wealth of information about every animal in the aquarium, answers to frequently asked questions, and information about where specific animals can be found within the aquarium galleries. An iPad would provide a great opportunity to view the animal guide inside the aquarium. It would be great if visitors could checkout a device at the start and use the camera feature to find information about a specific animal they are viewing in real time. This might provide an opportunity for visitors to share information and interact with other visitors, extending the learning experience beyond a single person or small group. Technology can play a great role in the aquarium, but it's best to give information a chance!